Maple pecan sticky buns are homemade, pull apart rolls packed with toasted pecans, cinnamon, and a brown sugar and maple syrup topping. Your family will love having these sweet treats at breakfast or brunch. No Kitchenaid required! 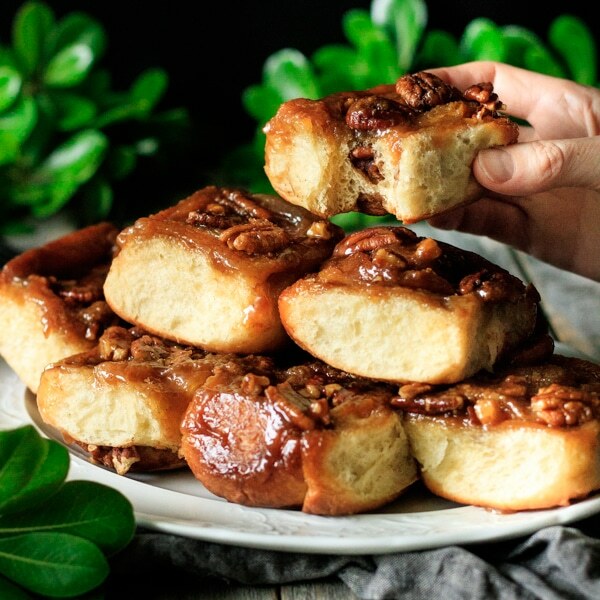 The good part is that you don’t need a sourdough starter to make fantastic maple pecan sticky buns; you just need some time for the yeast to work. It’s totally worth the wait! And especially since these buns freeze so well, don’t feel guilty about making a whole batch. Just pull one out from the freezer whenever you crave something sweet. 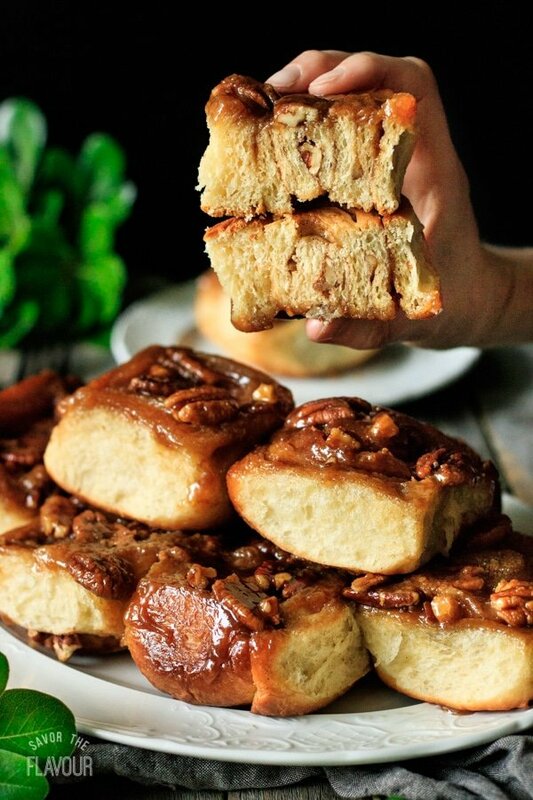 Lovin’ this sticky bun recipe? Check out these other sweet bread recipes your family will rave about. 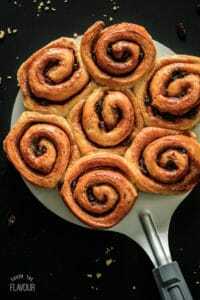 Cinnamon Buns with Raisins: these simple, sweet buns will delight young and old alike. How to Make Hot Cross Buns: lemon and orange peel, raisins, and fruit flavor these sweet Easter buns. 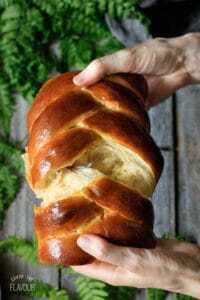 How to Make Easy Challah Bread: learn how to make this fluffy braided challah bread like a pro. 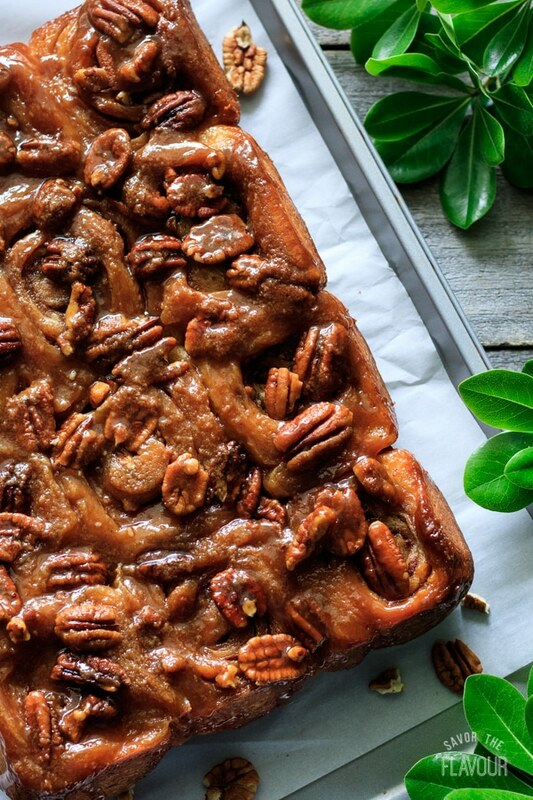 The pleasure of a 5-star review on this sticky bun recipe would be greatly appreciated. Warm the milk to 115 F.
Place the flour in a large mixing bowl and pour in the salt and yeast on opposite sides of the bowl, then stir in each one with your finger. Mix in the sugar and add the softened butter, sour cream, and eggs. Start mixing the dough with your hand and gradually trickle in the warm milk. Add just enough milk to create a soft, stretchy, and somewhat sticky dough. Turn the dough out onto a lightly floured surface and knead for 10-15 minutes, until the dough has a glossy sheen and no longer sticks to the work surface. Most importantly, the dough should pass the windowpane test. Test the dough by stretching a lump of it between the thumb and forefinger of each hand. The dough should stretch until translucent without breaking; if not, knead for a minute longer and check again. Shape the dough into a ball, place in a buttered bowl, and cover tightly with plastic wrap. Set aside in a warm place and let the dough prove until it’s at least doubled in size, about 1 1/2 hours. While the dough is proving, prepare the topping. Spread 1 3/4 cups of pecan halves on a small cookie sheet. Roast the nuts at 350 F for 8-10 minutes, stirring halfway through. Keep an eye on the nuts so they don’t burn. Lightly butter the base and sides of a 9×13-inch cake pan that’s at least 2 inches deep. In a medium saucepan, melt the butter and add the sugar, maple syrup, and milk. Stir until the sugar has fully dissolved, then let the mixture boil for a couple minutes. Pour immediately into the prepared pan and sprinkle 1 cup of toasted pecan halves evenly over the top. Let cool until the buns are ready. Turn out the dough onto a lightly floured surface and punch it down all over to knock out the gas pockets, then roll the dough to a 15×18-inch rectangle. Brush the dough with the melted butter, then stir together the brown sugar and cinnamon until thoroughly mixed and sprinkle evenly over top. Chop the remaining 3/4 cup of toasted pecan halves into small pieces, then sprinkle over the dough. Tightly roll up the dough from one of the short ends and pinch the seam to seal. Cut off the ends with a piece of stout thread by placing the thread under the log and pulling it tight to make a loop. Keep tightening the loop until it cuts through the dough. Slice the log into twelve equal slices and place them evenly in the prepared pan. Place the pan inside of a large, clean garbage bag, inflate the bag, and tuck the ends underneath to seal. Set aside in a warm place until the buns’ sides are touching and the dough springs back when gently prodded with a fingertip, about 1 hour. About 10 minutes before the bread is done proving, preheat the oven to 375 F.
Bake the buns at 375 F for about 20-25 minutes, until they’re a rich golden brown. Cover with a sheet of aluminum foil if they’re getting too dark. The center buns should have an internal temperature of at least 190 F.
Let the buns cool for 5 minutes in the pan, then invert onto a large cookie sheet. Serve the buns warm. Bake the cut off ends in a large ramekin along with the buns. 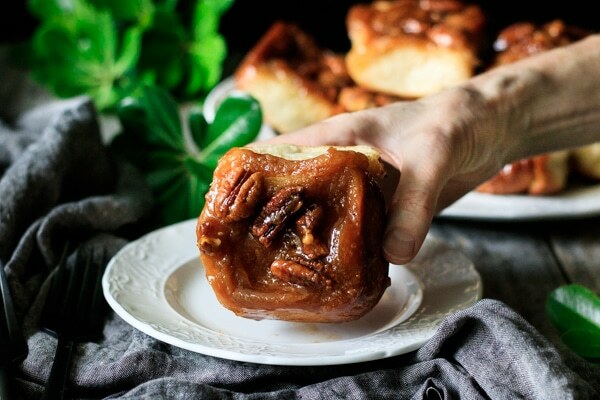 Leftover sticky buns freeze very well and can be quickly defrosted for a delightful snack.